Family members wearing shirts from the EGA shop at their Marine's graduation. A shout out to the EGA Shop! We ordered shirts for graduation. I am VERY impressed by their professionalism and concern for us. Thank you so much!! The EGA Shop has the "Ooh Rah" spirit gear for you! 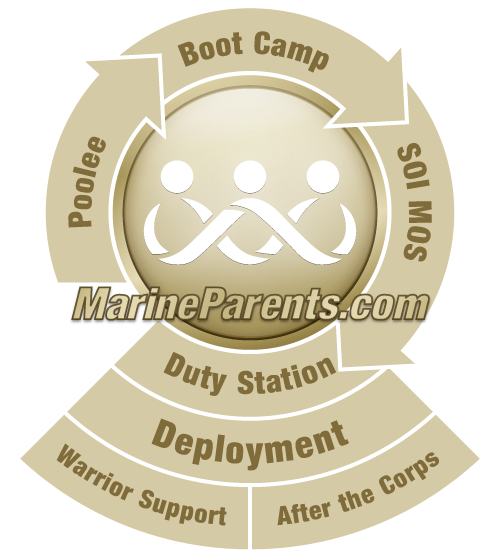 Brought to you by MarineParents.com, Inc. and RecruitParents.com. EVERY purchase supports our troops because 100% of the proceeds from the EGA Shop benefit the outreach programs of MarineParents.com, Inc., so why not support your soon to be Marine with a custom t-shirt, while supporting other Marines at the same time? Once your recruit becomes a Marine, deck out your closet with "Proud Marine Mom" (or Dad, Sister, Girlfriend, Wife, Grandma, etc.) t-shirts and accessories! Check out all of our Marine Family Designs. You won't find these anywhere else, because they are designed exclusively at the EGA Shop! Click here! I honestly could spend about a thousand dollars in this store. They have such a wonderful selection! Especially love the longer fitted shirts for women.